With a massive fan following, Sridevi’s daughter Jhanvi Kapoor is already a social media star. Mumbai: With a massive fan following, Sridevi’s daughter Jhanvi Kapoor is already a social media star. Jhanvi, who is currently in New York where she is doing course in acting, will soon make her Bollywood debut. Since the diva comes from a well-known filmy family, her fans want to know everything that she does or goes around in her life. 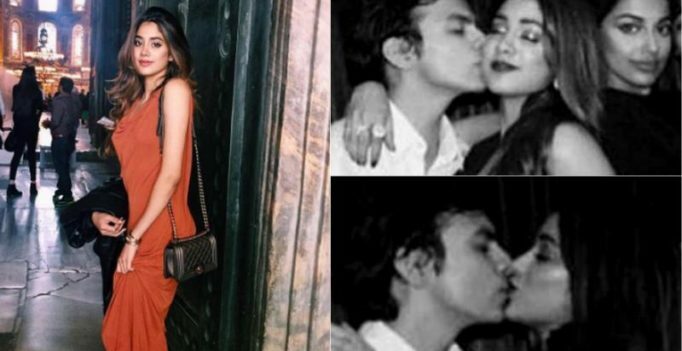 So far, we have seen Jhanvi hanging out with family and friends and now recently, new adorable pictures found its way on the internet where we see the next gen star locking lips with her beau Shikhar Pahariya. The moment the pictures found its way on the Internet, it went viral. Shikhar Pahariya is former Union Minster Sushil Kumar Shinde’s grandson. Shikhar’s brother Veer is rumoured to be dating Saif Ali Khan’s daughter Sara Ali Khan. Apart from Jhanvi, her sister Khushi Kapoor is quite the social butterfly as well. Kareena nuzzling her baby, Prince Taimur Ali Khan, is by far the cutest thing ever!